In 2012 the school found out that we’ve received a Comenius grant from The British Council to participate in a European project that will last for the next two years. From now until the end of June 2014 we will co-operate with schools from five other European countries on a project entitled ‘The Good Life’. The project’s main aim will be to encourage us as pupils to consider what makes a ‘good life’, and to urge us to act in order to ensure the best possible quality of life for ourselves now and in the future. We will consider many current and relevant themes - such as healthy eating, physical activity, safeguarding our environment, sustainability, creating and maintaining relationships with others, the structure of our school community, etc. Each month we will communicate with children from the other schools through the use of e-mails, Skype, letters, postcards, greeting cards, etc. to share ideas and information. Through participating in various activities we will present a picture of our lives here in Wales, as well as learn about children’s lives in the other countries, by concentrating especially on the ‘good life’ theme. All pupils involved in the project will also exchange vocabulary in our native languages, and will learn from each other about our different cultures, traditions and customs. Another central element to the project will be visits by teachers from the different countries to each other’s schools in order to share ideas about teaching and learning. Mr Williams, Miss Llwyd and Miss Gwenan Morgan visited Munkebjerskolen school in Odense, Denmark at the beginning of October, and another visit to Martinniemen Koulu school in northern Finland has been arranged for the end of January. 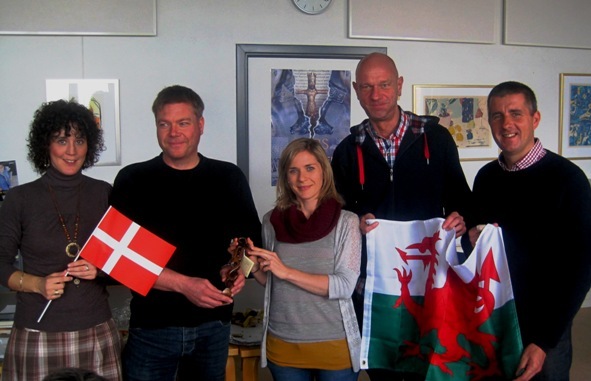 We will welcome teachers from the other schools to Aberystwyth in May 2013. We have already started on the project’s work, and one exciting activity Year 5 and 6 pupils have recently been involved in is designing an official logo for the project. We will need to choose one of these designs to represent Ysgol Gymraeg in a competition against designs from the six other schools, and the winner will then become the official ‘The Good Life’ logo. During the last few weeks pupils in years 5 and 6 have been designing a new logo for our Comenius project. The pupils themselves have drawn a short list of the most successful logos which include four logos from each house - Arthur, Caradog and Dewi. See logos below. Take a look at the logos below and send any comments you may have by e-mail, so that we can consider your feedback when deciding on the logo which will represent Yr Ysgol Gymraeg. Many congratulations to Lisa Cowdy of Year 6 on winning the vote for the best Logo to represent Ysgol Gymraeg in the Comenius Logo Competition. Lisa's logo won the most votes by pupils in Years 5 and 6, and was popular amongst the e-mails sent by parents also. Lisa beat 85 other competitors and will now be entered into the next stage, against the best of our partner schools in Denmark, Turkey, Ireland, Finland and Italy. Today Year 5 and 6 pupils took part in physical activities with pupils from Ysgol Llwyn yr Eos as part of our Comenius project, ‘The Good Life’. Pupils from both schools are part of the two year European project, which aims to develop their awareness of the importance of keeping fit and healthy. Ysgol Gymraeg’s hall was extremely busy this afternoon as Year 6 pupils from both schools competed eagerly in shuttle games, and Year 5 had the same experience over at the Llwyn yr Eos campus. Following a fun-packed afternoon both schools look forward to co-working again in future. 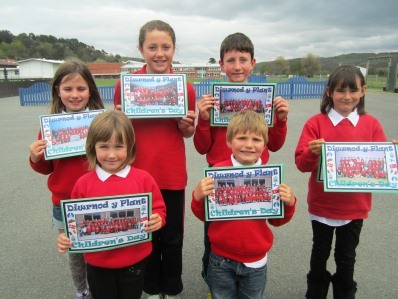 This week six very special Christmas cards will be sent from Ysgol Gymraeg to schools in all corners of Europe. As part of the work for our Comenius project, ‘The Good Life’, we will send a card to all the other schools who form the project with us – schools in Finland, Denmark, Turkey, The Republic of Ireland, Italy and Ysgol Llwyn yr Eos here in Wales. The A3 sized cards show one design from each year chosen from the hundreds of cards originally designed for the Year 6 Christmas Cards Scheme. Seen in the picture are Pegi from the Nursery class, Dafydd from Reception, Opal from Year 1, Iestyn from Year 2, Maria from Year 3, Lucie from Year 4, Courtney from Year 5 and Gwenllian from Year 6 with the cards ready to be sent. Before long we will hopefully receive cards in reply to ours from our friends in Europe – we’ll therefore need to wait patiently for the postman every day! Here is a clip of Year 3 and 4 pupils singing a verse from the traditional Christmas carol, 'Dawel Nos' (Silent Night).The clip is also shared on the official website of our Comenius project, 'The Good Life', where clips of pupils from all the project countries singing the carol in their native languages can be seen. It's lovely to hear the same carol being sung melodically in different languages by children from all corners of Europe. At the moment our European Comenius project’s mascot, Comus, is spending time with us here at Ysgol Gymraeg. Before this, Comus has been living with our friends in our partner schools in Turkey, Denmark, Finland and Ysgol Llwyn yr Eos, and he will proceed with his journey when he travels to Italy with school staff members in November. This week, Comus has been very busy in the company of the Reception children – learning to paint, write, sing, count, build, and even eating lunch! He also went on a lovely walk along Plascrug Avenue. Comus will definitely have some interesting stories to tell his new friends in Italy about his time at Ysgol Gymraeg.